The user selects a product category from a dropdown list. The form filters the list of products based on the selected category. The user selects a product from the filtered list of products. This might sound trivial, but it took me a while to work out the nuances and it doesn't seem to be particularly well documented anywhere, so I figured I'd share it. 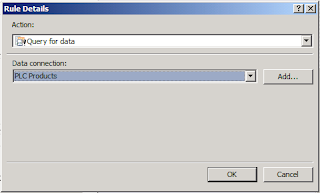 Essentially, InfoPath 2010 includes a new feature that allows you to specify query fields when you connect to a SharePoint list. This allows you to create cascading dropdowns without resorting to custom code, custom data sources or Web services. Here's a walkthrough of the process. Remember that Product Categories is our "master" list and Products is our "details" list. I'll assume a rudimentary knowledge of InfoPath in that you're familiar with data connections, binding controls to fields and so on. First, create a secondary data connection to the Product Categories list. This is straightforward, the list only contains one field. 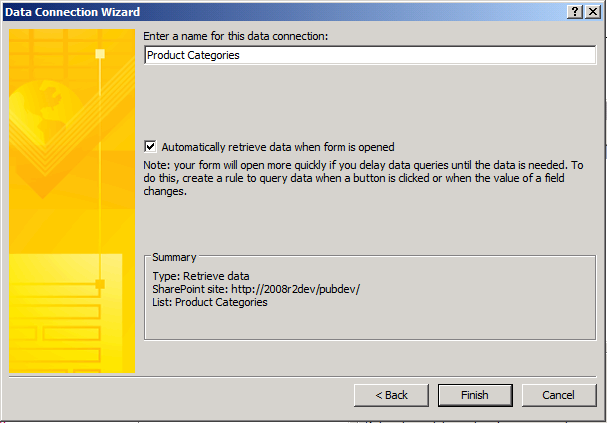 Ensure that you leave the Automatically retrieve data when form is opened option selected. 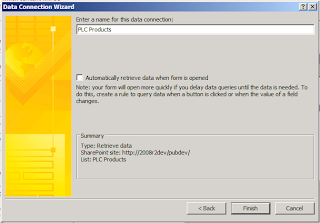 Next, create a data connection to the Products list. 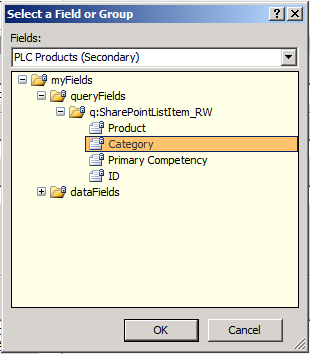 When you select the fields you want to include, ensure you select the Category (lookup) field as well as the Product field. 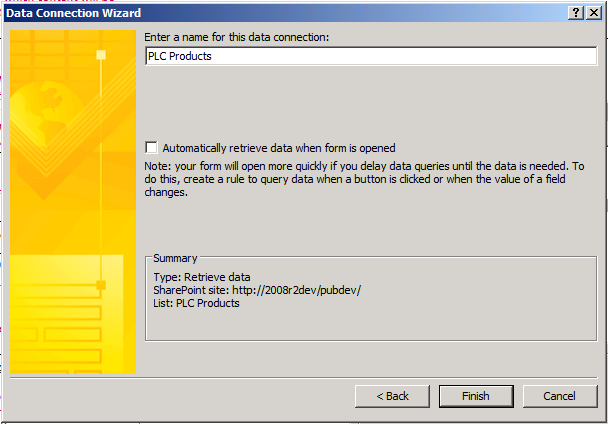 On the last page of the wizard, ensure you clear the Automatically retrieve data when form is opened option, and then click Finish. We don't want the form to retrieve a list of products until we've specified the category value we want to use as a filter. Build your form template. I've used dropdown lists to represent the product category and the product. Both controls are bound to simple text fields in the main data source. 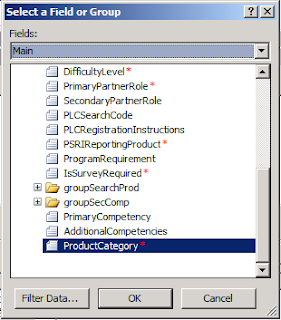 In the properties for the Product Category control, configure the dropdown to retrieve choices from the Product Categories data source that you created in step 1. 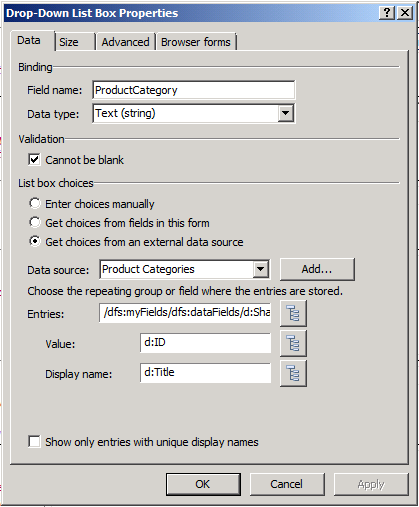 Ensure that you select the ID column as the Value field. (Lookup columns only store the ID field from the related list, so we'll need to match these ID values to the category lookup in the Products list). 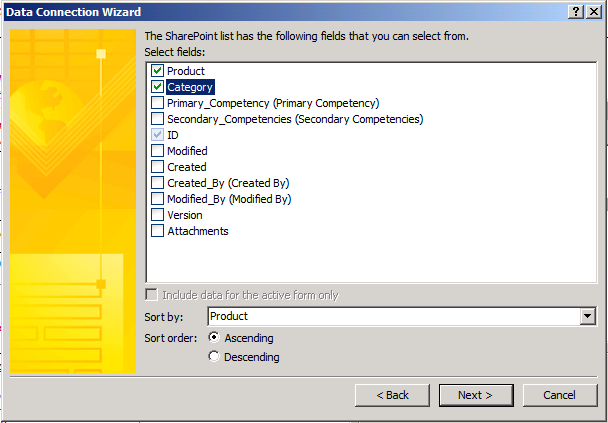 Retrieve choices from our SharePoint lists. Store the user selections in the main data source. We can now use InfoPath rules to set up the cascade filtering we're looking for. Select the Category control. On the Home tab, on the Add Rule dropdown, click This Field Changes, and then click Set a Field's Value. This launches the Rule Details dialog. Click the button to the right of the Field text box. 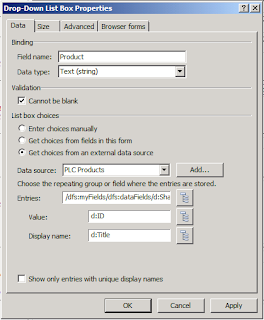 In the Select a Field or Group dialog, select the Products data connection, expand queryFields, select the Category field, and then click OK.
By setting the value of this field, we are configuring the Products data connection to only return product records where the product category matches our specified value. 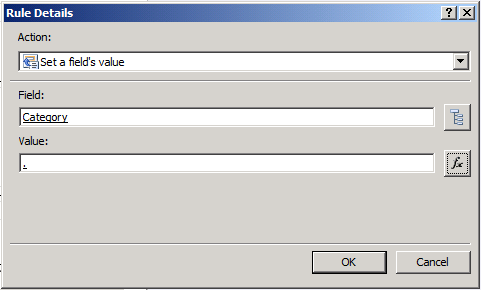 Click the function button to the right of the Value text box, and then click Insert Field or Group. Ensure the Main data connection is selected, select the field that stores the product category value selected by the user, and then click OK.
We have now set the value of our query field to the ID of the category selected by the user. The Rule Details dialog should resemble the following. 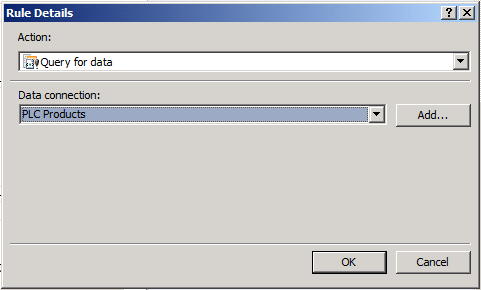 Click OK to close the Rule Details dialog. Now that we've set our query field, we can call on the Products data connection to populate the Products dropdown list. 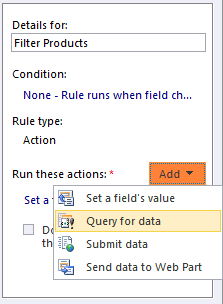 In the Rules pane, on the Add dropdown, click Query for data. 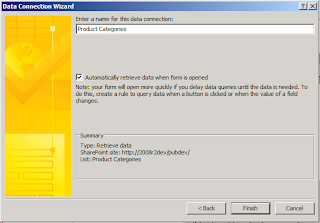 Under Data connection, select Products, and then click OK. Thanks. Just a question, in the view wont this mean that I will see the ID of the Product and not the product name ? Hi Alison - when you set the data binding properties for the dropdown controls (5th and 6th images in this post), you can map the Value and Display Name properties to different columns in the SharePoint list. 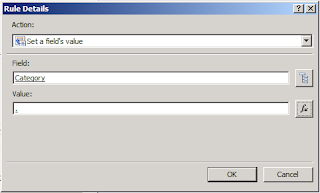 Map the Value property to the ID column, since this is what SharePoint uses to build list relationships. Map the Display Name property to whichever column you want the dropdown to display - title, product name, description, anything. Your form will then use the ID value behind the scenes, but the UI will show the column value of your choice. Thank You Jason.it's really helped. just a one question, for insert form it's work fine when I open the form for edit it shows the item number(ID) in the dropdown.if i re change the first dropdown then second dropdown shows the name again. can't i change it? 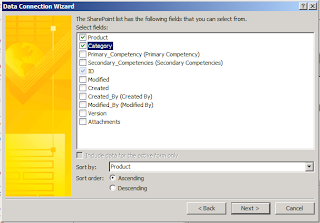 Can you show how to do this via SharePoint/SharePoint Designer 2010? I already have the lists built in the site.